Synopsis: A story of survival, subterfuge, espionage and identity.Rhoda and Delia are American stunt pilots who perform daring aerobatics to appreciative audiences. But while the sight of two girls wingwalking – one white, one black – is a welcome novelty in some parts of the USA, it’s an anathema in others. Rhoda and Delia dream of living in a world where neither gender nor ethnicity determines their life. When Delia is killed in a tragic accident, Rhoda is determined to make that dream come true. She moves to Ethiopia with her daughter, Em, and Delia’s son, Teo.Em and Teo have adapted to scratching a living in a strange land, and feel at home here; but their parents’ legacy of flight and the ability to pilot a plane places them in an elite circle of people watched carefully by the Ethiopian emperor, Haile Selassie, who dreams of creating an air force for his fledgling nation. As Italy prepares for its invasion of Ethiopia, Em and Teo find themselves inextricably entangled in the crisis — and they are called on to help. 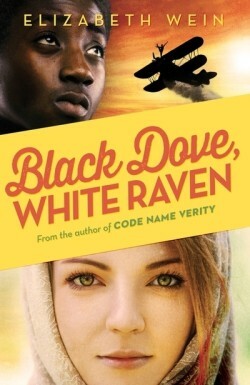 In recent years, Wein has made a name for herself writing superb historical fiction that heavily features female protagonists and flying, so it’s hardly surprising that her latest novel, Black Dove, White Raven is an extension of her success with Code Name Verity and Rose Under Fire, even if it is set on a new continent: Africa! Set in the 1930s, Black Dove, White Raven is the story of Teo and Emmy. With no blood relations, they’re as close as siblings, having been brought up by their two aerobatic mothers Delia and Rhoda. All four dream of a place and time where the different colours of their skin no longer matter; where half-Ethiopian Teo can walk alongside half-Italian Emmy; Delia dreams of returning to Teo’s homeland, the only African nation never to have been invaded. When she dies in a flying accident, it’s all Rhoda can do to honour her friend and fly the clear African skies. Like its predecessors, Black Dove, White Raven is a frame-narrative from dual perspectives, introduced first by Emmy as plea to the Ethiopian emperor Haile Selassie before presenting the flight logs of the two, in which their story is told. Unfortunately, it’s not as effective here as it was for Code Name Verity, being more confusing than it is helpful. It’s difficult to tell apart Teo and Emmy’s logs too, though I appreciated the insight into their characters. Similar again is the slow-burning nature of the story; Wein’s novels are typically slow starts that build up to a crescendo, and Black Dove, White Raven is no different: it’s engaging from the start, thanks to Wein’s penchant for characterisation, but things only start to heat up when Ethiopia is threatened by Italy. I’m always struck by how organic her stories feel; there’s no sense of forced drama, and Wein reaps the rewards of her slow-burner with the climax of the novel which is, once again, gut-wrenching. That’s where the similarities end; themes of race and colour mean Black Dove, White Raven charts a different path to the World War 2 centred novels Code Name Verity and Rose Under Fire; the Ethiopian setting only exacerbates its differences to the two, though in that respect it is closer to some of her earlier novels, also set in Ethiopia (albeit some 1500 years previously). It’s evident that Wein hasn’t run out of ideas, and her portrayal of female and black pilots in historical fiction is refreshing rather than forced, making Black Dove, White Raven another successs.